A 32-year-old male presents to the Sydney podiatrist clinic, for a detailed running assessment and footwear recommendation. This patient does not present with any pain or biomechanical problems. He boasts good foot health and has been free from injury for the last 12 months. He reports to the practitioner at Sydney podiatrist that he would like to have a detailed running assessment in order to reduce the likelihood of developing any injuries further down the track. He would also like to discuss with the practitioner, running style and running efficiency. This patient has never seen a podiatrist before but does occasionally visit a massage therapist in order to assist recovery. He pays close attention to calf muscle, quadricep muscle and hamstrings massage. He reports to the practitioner that he takes daily doses of magnesium tablets. He informs the podiatrist that he takes sound advice from the staff at athlete’s foot, and is committed to wearing the correct functional running shoes. He has been running wit He informs the podiatrist that he takes sound advice from the staff at athlete’s foot, and is committed to wearing the correct functional running shoes.h the Asics gel Kayano for approximately three years. He decided to visit the practitioner at Sydney podiatrist prior to the Canberra Marathon to discuss any biomechanical anomalies. 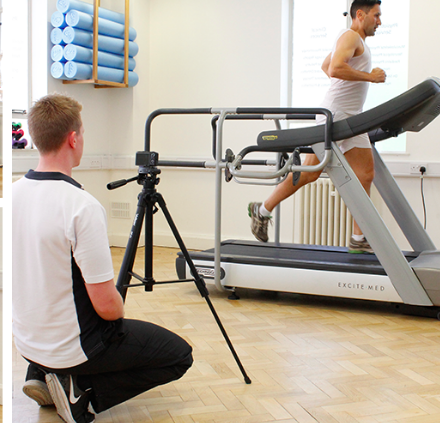 The practitioner at Sydney podiatrist, Martin Place, prepares the runner for a treadmill assessment whereby his running style would be captured and recorded. The patient was prepared with bisection lines which were placed on his lower limb and foot. This would allow the practitioner to observe pronation, supination, heel lift, foot placement, tibial torsion, lower limb rotation, and other biomechanical factors. The patient was asked to walk, jog, and run at his normal speed while his running style was captured using digital software on an iPad. The Sydney podiatrist was able to observe significant over pronation bilaterally, through the subtalar joint when running at the patient’s usual pace. During walking, pronation was minimal. During over pronation, excessive internal rotation through the tibia could be noted. The patient demonstrated an externally rotated foot position causing lateral heel strike. There was a matching wear pattern on the patient’s running shoes, at the lateral side of both heels. The podiatrist explained to the patient that the lateral foot strike creates a pronation moment around the subtalar joint. The podiatrist was also able to observe early heel lift on the right side, which may indicate a short leg. The patient demonstrated a long stride, with a relatively low cadence. He had a heavy heel strike which is also something which increases the pronation moment around the subtalar joint. The practitioner explained to the patient that a heavy heel strike creates a larger ground reaction force, which increases fatigue and also increases the likelihood of injury. The practitioner at Sydney podiatrist carried out some measurements with the patient lying down. He also carried out some muscle testing and joint range of motion. The calf muscle on the right leg, with the early heel lift, was found to have a more restricted range of motion compared to the left. The patient was advised that he needed to stretch the right calf muscle more diligently, but that further investigation should be carried out in order to determine the cause of the early heel lift. The podiatrist carried out a series of leg length measurement testing with the patient lying prone and supine. A short right leg was suspected, and to this and the patient was referred for a CT scannogram for clarification. The patient was also found to demonstrate extreme tightness in both gluteal muscles, which would tie in with the externally placed foot position during heel strike. Following the CT scannogram, the patient returned to see the practitioner at the Sydney podiatrist rooms, to discuss the findings. The report concluded that the patient demonstrated a 7 mm shortening of his right tibia. The practitioner at Sydney podiatrist explained to the patient that a 7 mm short right leg should only be considered a minor concern. Quite often, the body is able to compensate for up to 8 mm without the patient reporting a problem. It was likely though, that the increased stiffness through the right calf muscle was a result of this leg length discrepancy. The patient was advised to be mindful of his short right leg, and to work diligently on the calf range through the right lower leg. He was advised that he could be issued with a two or 3 mm heel lift to place inside his shoe if he developed symptoms. Symptoms could arise in the lower leg, knee, hip or lower back. The sports podiatrist demonstrated and the patient followed, calf stretching techniques. The patient was advised that his running shoes were appropriate and that there was no need to change the make and model of shoe. The podiatrist also demonstrated gluteal stretches. The practitioner at Sydney podiatrist discussed running style with the patient in order to improve efficiency and reduce fatigue / injury. He was advised to shorten his stride and therefore increase his cadence. This would reduce the ground reaction force and remove his heavy heel strike, which can be seen as applying the brakes. By shortening his stride, he would naturally develop more of a midfoot strike. The podiatrist also suggested that the patient be mindful of his externally rotated foot position. He would be able to reduce the amount of pronation if his feet pointed closer to 12 o’clock when making contact with the ground. The Sydney podiatrist advised the patient in summary that he would be fine to continue as a runner and would be less likely to develop injuries if he followed the stretching program and running style advice. He was informed that some patients with over pronation resort to the use of a prescription orthotic, but at this stage this would not be necessary. The podiatrist advised the patient to return the clinic if he needed further advice on running style or if he felt that he was developing an acute or chronic condition, relating to his biomechanical anomalies. Please note that the information contained in this article is not general advice but is specific to one particular patient at the Sydney podiatrist clinic, Martin Place.